On 22 September 2016, the European Union approved the International Financial Accounting Standard 15 – Revenue from Contracts with Customers (IFRS 15), which contains revenue recognition requirements. The standard applies for annual periods beginning on or after 1 January 2018. IFRS 15 will replace all existing regulations and interpretations concerning revenue recognition. The core principle of the new standard is that an entity will recognise revenue in its financial statements so as to depict the transfer of goods or services to customers in an amount that reflects the consideration (i.e. payment) which the entity expects in exchange for those goods or services. Pursuant to the new regulations, revenue arises when the control over goods or services passes to the customer. The transfer of control is not the same as the transfer of risk and rewards, and not necessarily the same as the culmination of the process of revenue generation as it is understood today. Entities will also have to apply the new guidelines to determine whether the revenue should be recognised over time or once at a defined point in time. The amount of recognised revenue should take into account the risk of the counterparty’s default and the appropriate portion of the variable consideration which, as estimated by the Board of Directors, is the amount of the expected payment. As a result of the implementation of IFRS 15, entities may experience significant changes concerning the amount of revenue and the time of its recognition and, in some cases, also of the costs of obtaining contracts. In particular, entities that have contracts with customers giving rise to various performance obligations will need to analyse such contracts in detail and determine the revenue recognition model for each performance separately as required by the Standard. This may mean the necessity of reconstructing transaction information collection and recording systems. IFRS 15 may significantly affect financial statements of companies, including their profitability ratios. The core principle of the new standard is the recognition of revenue so as to depict the transfer of goods or services in an amount to which the entity expects to be entitled in exchange for delivered goods/services. Pursuant to the new regulations, revenue arises when the control over goods or services passes to the customer. In this step, an entity should analyse which contracts must be combined under IFRS 15 and how to treat the modification of contracts. For example, should an additional construction contract to construct a footbridge near a housing estate be combined with the main contract for the construction of the housing estate or be treated as a separate contract? 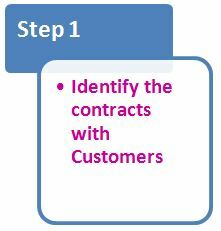 determine whether a good or service is distinct in the context of the contract. For example, the sales of a machine with assembly and maintenance services — which of these performances form a single obligation and which of them are separate and independent performances. the consideration paid to the customer (e.g. covering the cost of adjustments needed to use purchased products). 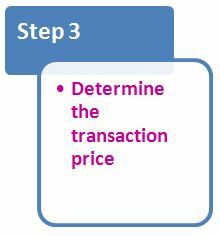 The transaction price (taking into account the components identified in Step 3, is usually allocated by reference to their relative standalone selling prices). 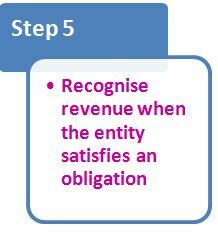 Revenue is recognised when (or as) the entity satisfies performance obligations (goods and services are transferred). A good is transferred and a service is performed when the customer gains control of them (‘risks and rewards’ have been abandoned). 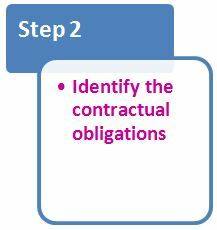 The costs of obtaining a contract are capitalised if the entity expects to recover them (e.g. agents’ commissions, salesmen’s commissions for obtaining contracts). An entity may immediately expense such costs when the asset amortisation period is one year or less. Such costs are recognised separately in the statement of financial position. An asset is amortised for the period of transferring goods or performing services, and is subject to impairment test — if the costs refer to more than one contract (e.g. planned extension of the contract), and the amortisation should take into account current and projected contracts. 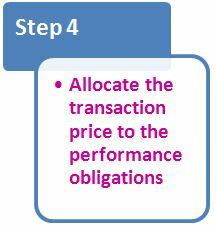 The costs of obtaining a contract are capitalised if the entity expects to recover them (e.g. agent’s commissions, salesmen’s commissions for obtaining contracts). Under the Standard, the requirements in IAS 37 for onerous contracts apply to all contracts in the scope of IFRS 15. The new Standard states that entities that are required to recognise a liability for expected losses under IAS 37will continue to be required to do so. Significant expansion of disclosures to enable users of financial statements to understand the nature, amount, timing and uncertainty of revenue and cash flows arising from contracts with customers. - capitalised costs incurred to obtain or fulfill a contract (qualitative information on the judgments made in determining the amount and method of amortisation; value information on the closing balance and the amount of amortisation recognised in the period). Effective date: 1 January 2018. Earlier application is permitted. - Full retrospective adoption, i.e. applying the standard to all periods presented in the financial statements as if the standard has been in force since the effective date of the contract; the cumulative effect of changes referring to the periods prior to the presented data is recognised in the opening balance of retained earnings of comparative information. - Modified retrospective adoption — the Standard applies only to the data from the current period (2018); comparative information is not restated; the cumulative effect of changes is recognised in the opening balance of retained earnings of the current period. The effect of the Standard adoption method on reporting data in the financial statements for 2018. If you have any questions or concerns - please contact us.